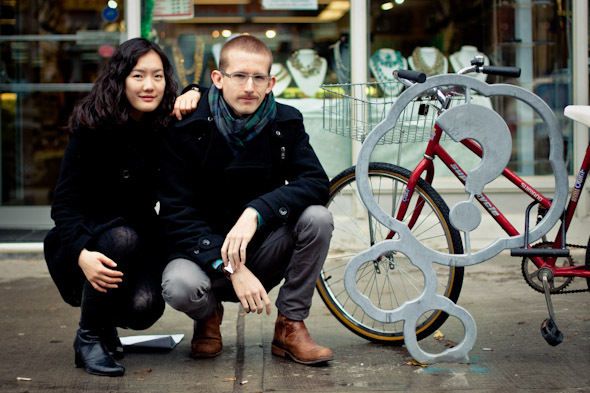 OCADU students unveil new bike stands on Queen St. 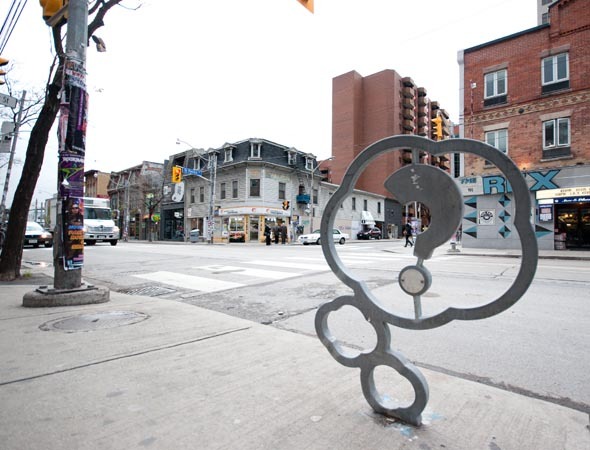 Speech bubbles and halos have popped up along Queen St. West -- they're the city's newest bike stands, devised by students at OCAD University with the goal of merging conceptual urban sculpture with functional infrastructure. 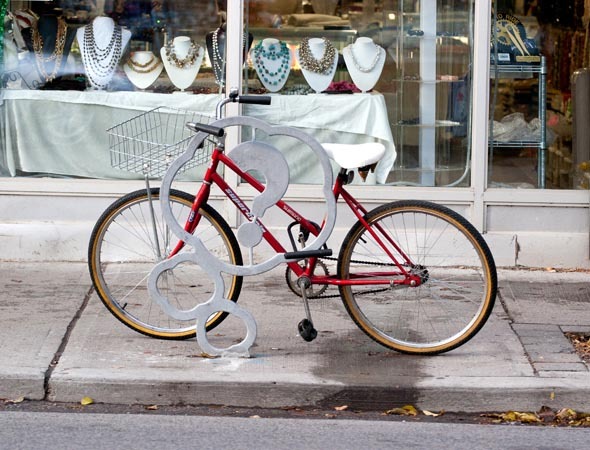 The fourteen new stands can be found along Queen St. West from Simcoe to Bathurst Street. 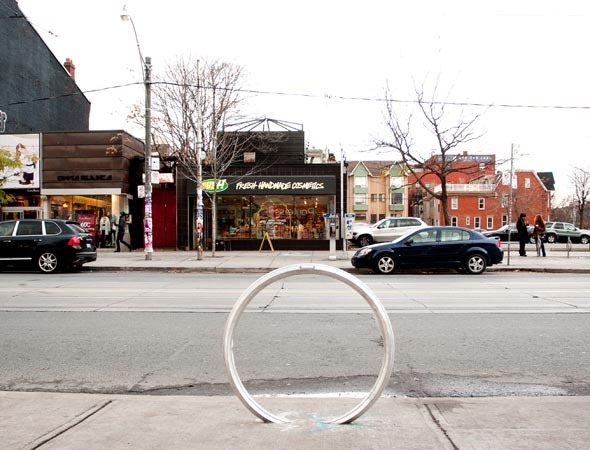 The designs were originally submitted to the Gateway Bike Stand Challenge held at OCADU in 2009, meant for a property redevelopment at Queen and McCaul Streets. 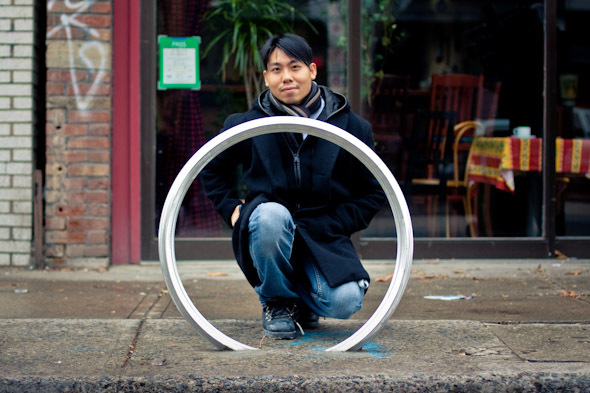 In the end, speech bubble designers Evi Hui and Olivier Mayrand and halo designer Michael Pham had their concepts chosen to develop into reality, in partnership with the Queen St. West Business Improvement Area (BIA). 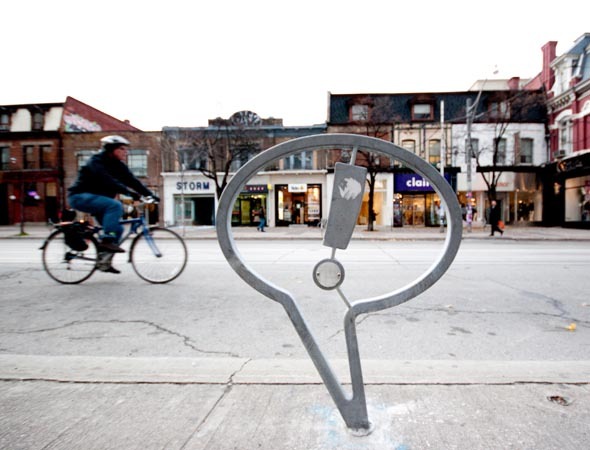 "As a jury member in the original competition, I was so impressed with the designs, I felt it was imperative we find a way to incorporate some of them into the Queen St. West streetscape," said Marc Glassman, Chair of the Queen St. West BIA. "I am proud that we were able to collaborate with the City of Toronto, an innovative fabrication company and these talented students to execute their design concepts." Evi Hui and Olivier Mayrand are two fourth-year Industrial Design students, while Michael Pham is a fourth-year Environmental Design student. Each of their concepts is simple, but they make a statement. Hui and Mayrand's speech bubbles feature a question mark, quotation marks, and an exclamation point, while Pham's halo is an elegant circular design embedded into the sidewalk. Hui and Mayrand designed the speech bubbles. "The inspiration came from Queen Street itself, and the street is a place of culture and expression," said Hui. "We also drew inspiration from pop culture signs and symbols." "Designing them wasn't the challenge so much as getting them into the real world," Mayrand said. "We spent a good two weeks designing, but actually bringing them out onto the street took another year. 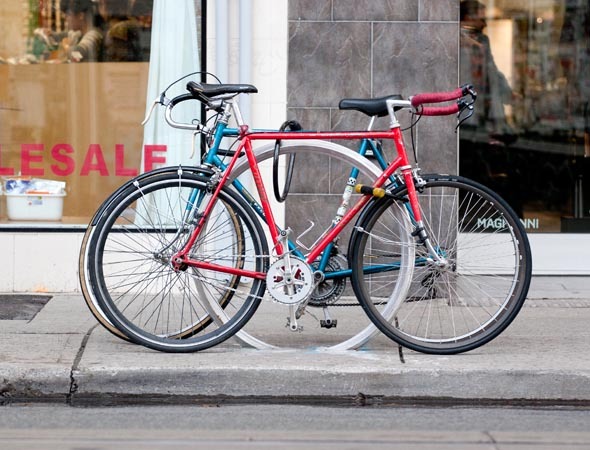 We needed to secure all the locations along the street, get permits from the city, address concerns like whether they would scratch people's bikes, and check to make sure the manufacturing could be done." According to Pham, his halo design came to him unexpectedly. "I like to play with form. I threw a ring on the floor and watched the way it spun," he said. "I wanted to do something different." Like Hui and Mayrand, Pham found the biggest challenge to be the in the physical development of the stands. "When you work with the city and you set a date for a project, you never know what will happen," he said. "The project was prolonged, and there was one point where they said they couldn't even build the stands. That was frustrating. It was complicated, but we eventually got it done." Representatives from the City of Toronto and the Queen St. West BIA worked with the students to make sure their original designs would remain unchanged. 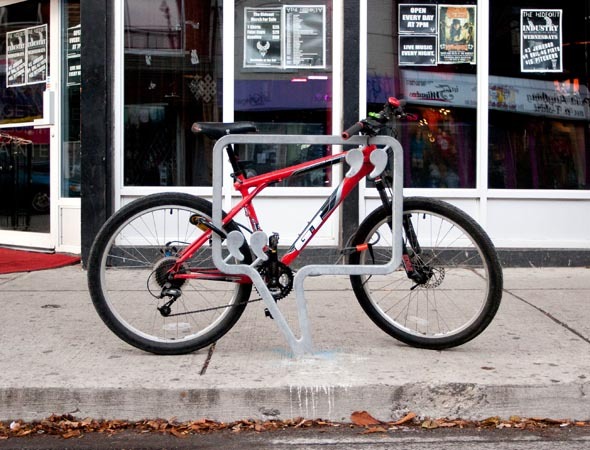 The bike stands, according to Hui, have been in use on Queen Street since late October. Third and fourth photos by Jen Tse. All other images by Denis Marciniak.